Shinedown has debuted the music video for “GET UP,” a song that appears on the group’s new album, “ATTENTION ATTENTION.” The video, which is streaming via YouTube, is powerful and communicates the song’s theme about battling depression. Grontman Brent Smith tells HuffPost that he penned the lyrics to “GET UP” about bass player Eric Bass’ time dealing with depression. Smith says he was even a bit nervous the first time he played the demo of the song for Bass. Shinedown plans to release a music video for every song off “ATTENTION ATTENTION.” “GET UP” is the third song off the set to get a music video, with “THE HUMAN RADIO” and “DEVIL” being the other two. 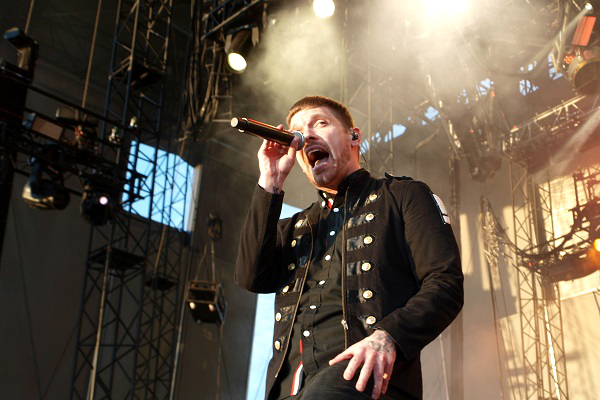 Shinedown is currently on the road in support of “ATTENTION ATTENTION” on a co-headlining tour with Godsmack. Like A Storm is also on the bill. Check out exclusive photos and a review of the tour here.